Leather notebook cover design and build. Design to finished product. I’ve chosen this notebook as it’s a fairly ubiquitous notebook here in the UK, it’s affordable, easily replaceable when you’ve filled it up with notes and can be purchased from lots of different outlets. The design might include a slip section for receipts or business cards, a pen holder or maybe a clasp to hold the notebook cover shut. 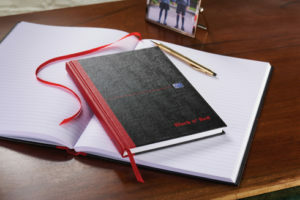 The Oxford Black n’ Red A5 notebook I will be designing a leather notebook cover for. Here are some great facts about the OXFORD notebook brand! Over 60 million OXFORD notebooks and diaries have been sold in Europe and worldwide. 3.8 billion sheets of paper are produced every year, enough to cover the surface area of the United Kingdom. OXFORD is the first brand to be awarded the EU Ecolabel for converted paper products in 2016. 100% of OXFORD products are manufactured with FSC® or PEFC® certified writing paper.